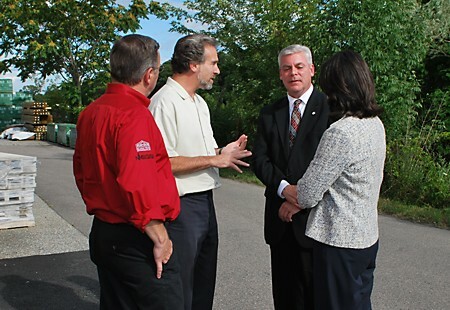 From Left to Right: Rob Goldstein (GM of Paint), Brandy Souza (Assistant GM of Kitchen Views), Maria Fratiello (Director of Human Resources), Michael McDole (VP of Sales), Margie Kaitz (CEO), Warwick Mayor Scott Avedisian, Rhode Island Lt. Gov. Elizabeth Roberts, Steven Kaitz (CEO), Manny Pina (President) and Bill Lee (Store Manager). 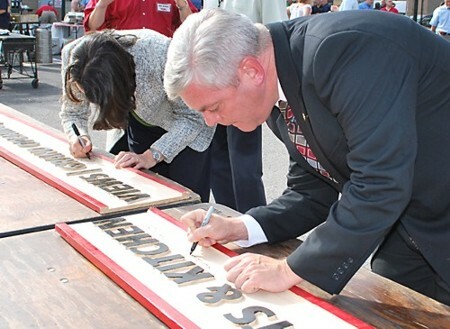 Warwick Mayor Scott Avedisian wielded a handsaw and cut the ceremonial board at the Grand Opening of National Building Products at 3356 Post Road, Warwick, RI on July 22, 2010. 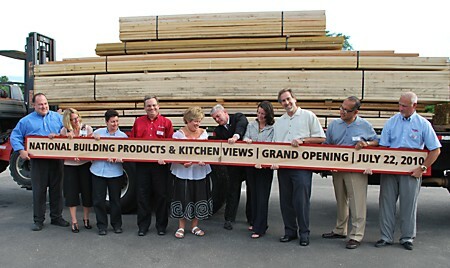 This is the eighth location for National, and our ninth Kitchen Views showroom, which is located inside the store. This is worth a look — the entire store has been remodeled, plus there is now a beautiful new cabinetry showroom. The finishing touches have just been made to the Kitchen Views showroom and everyone is welcome to come see it for themselves. In addition to Valspar paints and all kinds of tools, contractors and homeowners will find something for every building construction or home improvement project. We also fill propane tanks and make keys. This location is familiar to many in the area as the former Eagle Lumber, off Route 95 at Exit 10. Come in and see what’s new! We’ve posted pictures of the event, plus pictures of inside the store and showroom, on our Facebook page. You can also view the album here. I love the way you have your blog set up!! This is the first time I have been on here. I am sure i will be back though.